Robert P. Walter is a founding shareholder in the firm. He is a 1991 graduate of Duquesne University School of Law, where he also received his undergraduate degree. He concentrates his practice in the defense of employers and insurance carriers in the areas of workers' compensation, unemployment compensation, Heart and Lung Act litigation, and subrogation, with a particular emphasis in workers' compensation subrogation issues. His practice also includes general insurance defense litigation including property, construction, and liability claims. 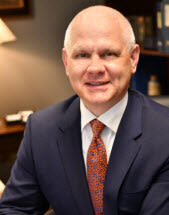 He heads the firm's workers' compensation subrogation practice and has established through his litigation skill and creative efforts, many of the most important and leading precedents which favor and enhance the subrogation interests of employers and insurance carriers. Bob's published opinions include Good Tire Service v. WCAB (Wolfe), a 2009 opinion, in which Commonwealth Court held that a defendant's subrogation lien is based on a pro-rata share of the fee actually paid to claimant's counsel, not the hypothetical fee which could have been paid pursuant to the fee agreement, where claimant's attorney attempted to "rescind" a portion of his fee in order to shield it from the lien. Bob counsels employers on a wide range of issues designed to avoid litigation including employee discipline and discharge. His clients range from Fortune 500 companies to closely held businesses. Bob has successfully defended every manner of injury claim as well as psychological claims. He is an active participant of the firm's Subrogation and Recoveries practice and oversees the protection and, where necessary, the litigation of workers' compensation subrogation issues. Through Bob's efforts and keen knowledge of workers' compensation subrogation, he has recovered millions of dollars for his clients. Bob is a member of the bar in all Pennsylvania state courts and United States District Court for the Western and Eastern Districts of Pennsylvania. He is member of the National Council of Self-Insurers and the Claims & Litigation Management Alliance. He has been listed as a Pennsylvania Super Lawyer in the area of workers' compensation litigation, and he was selected by Best Lawyers in America for his experience in the area of workers' compensation defense. Good Tire Service v WCAB (Wolfe), 978 A.2d 1043 (Pa. Cmwlth 2009), Defendant's lien based on fee actually paid to claimant's attorney, where such fee is less than the amount recited in the fee agreement between claimant and his attorney.